There are many exciting and entertaining theme parks, but Morgan's Wonderland is a park with a special mission. As the first fully accessible theme park of its kind in the world, Morgan's Wonderland was awarded Trip Advisor's 2015 Travelers' Choice Award as one of the Top 25 Amusement Parks in the United States. 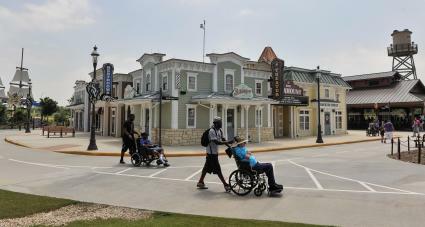 Opened in 2010 in San Antonio, Texas, Morgan's Wonderland is the first completely wheelchair-accessible theme part in the world. 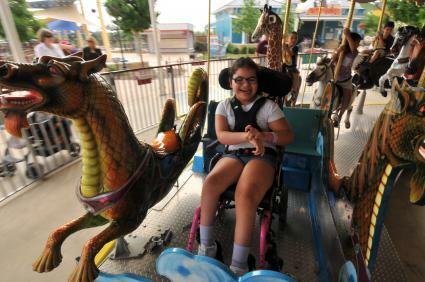 From the rides to the attractions to the entertainment, this park is the amazing result of the dreams of Gordon and Maggie Hartmann, whose daughter Morgan has physical and cognitive challenges. Morgan's indomitable spirit serves as the park's inspiration. As someone who is directly involved with the park, Bob McCullough, Communications Director for Morgan's Wonderland, shared some of his insights into this unique experience. When asked who is the best audience for Morgan's Wonderland, he cheerfully responded, "Everyone - individuals of all ages with or without disabilities." You only have to look around to see that butterflies are prominent throughout the park. They're there to remind guests that anyone, individuals with or without special needs, can reach new heights in personal achievement simply by emerging from their "cocoons." To reflect this philosophy, the mascot of Morgan's Wonderland is a colorful, fun-loving butterfly named Joy. According to Bob, "Joy's full scientific name is Spreadajoy Nonstopus, and she is dedicated to promoting inclusion and seeing everyone soar to new heights." In light of Joy's infectious exuberance, it should come as no surprise her favorite song is Wind Beneath My Wings. She is very visible as she greets guests and poses for photos with new friends. She also makes special appearances from time to time to spread joy at children's hospitals in the San Antonio area. In addition to Joy, Morgan's Wonderland has taken the idea of amusement park characters to a new level by creating personalities who are completely relatable to park visitors. The Wonder Squad has been a part of the park since 2010, but they were really brought to life in 2015. According to Bob, "The phenomenal four each have cognitive or physical special needs when they're in the real world, but their disabilities transform into super abilities when they come to Morgan's Wonderland." Together, the Wonder Squad is capable of anything at Morgan's Wonderland and stands as a beacon of strength, fortitude, and encouragement for all who meet them. Wearing a bright yellow super hero outfit with blue butterfly wings, Morgan supersedes her cognitive and physical challenges. Rocket, sporting a thunderbolt, gains super human speed with his supercharged wheelchair. 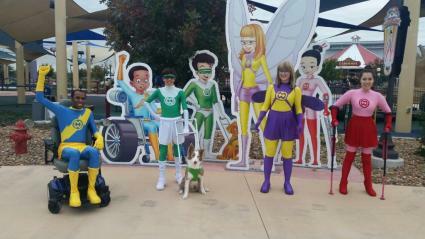 X-Ray, accompanied by his guide dog Uno, possesses amazing X-ray vision and dazzles in his green and yellow costume. Jette, dressed in pink and red, also overcomes her physical disability. This unique, thoughtful approach to the characters which represent Morgan's Wonderland perfectly expresses the philosophy of inclusion at this special place. Every guest, regardless of their physical or cognitive abilities, will find their spirits lifted when they become acquainted with the Wonder Squad and Joy the butterfly. No theme park would be complete without rides. According to Bob, "There are currently four rides at the park which are accessible to everyone via special features that include them in the fun. All of our rides are popular, but most guests don't want to miss our colorful carousel." The Carousel: This beautiful carousel is designed with special "chariots" for wheelchair guests so one and all, even guests with differing abilities, can fully experience the ride. The Off-Road Adventure Ride: Off-roading in a cool cruiser along a track full of twists and turns has never been so much fun. With views of many of Morgan's Wonderland attractions along the way, everyone can experience the adventure with specially equipped vehicles. 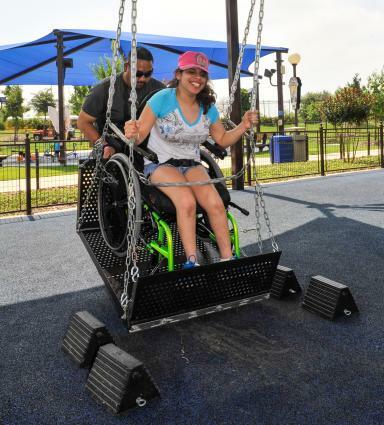 The Wheelchair Swings: Featuring more than 30 adaptive and traditional swings, young and young-at-heart guests can swing and play to their heart's content. 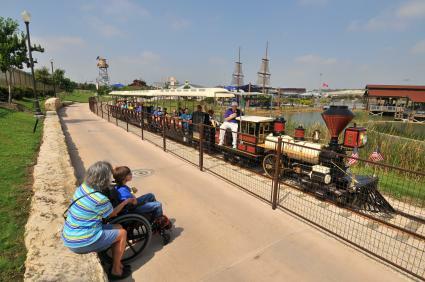 Wonderland Express & Depot: Chugging around the eight-acre lake, this little train is equipped with multiple cars with wheelchair-accessible ramps which allow the entire family to enjoy the trip together. Whirling Wonder: The newest addition and fifth ride at Morgan's Wonderland is set to debut in the spring of 2016. Guests will be able to ride high and take in all the sites from one of twelve accessible gondolas on the beautiful hot-air balloon theme Ferris wheel. In addition to the great rides, Morgan's Wonderland is filled with interactive attractions certain to get everyone involved. 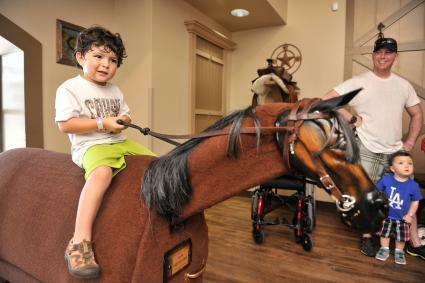 Designed to encourage creative play, Sensory Village™ offers a wide-range of experiences. The Village Market: This is where younger guests can play at grocery shopping. KMWL-TV Channel 7: Guests get a chance to experience what it's like being on television. Paramount Theatre: This special theater includes interactive videos. Saddle-Up Stable: Guests can give the equicizers a try. These are non-motorized, mechanical horses which simulate the movements of actual horses, and they are popular in therapeutic horseback-riding programs. Butterfly Playground and Pirate Island Playground: Designed with play in mind, both colorful areas feature shade, swings, and a lot of objects to climb and explore. Surfaces are rubberized for safety and comfort. 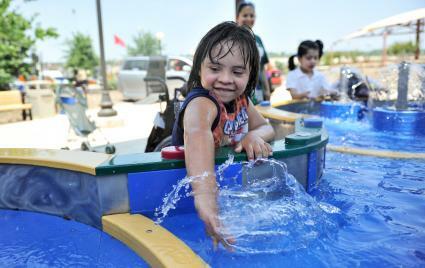 Water Works: This sensory experience uses tactile, aural, and visual features in addition to, of course, water. With full wheelchair access to all the fun, guests can get a little wet from all the pipes, water wheels, dams and other features which squirt, splash, and generally make things a bit zany. Music Garden: This is the place where notes are planted and music is grown via a variety of percussion instruments that encourage everyone to become a musician. Sand Circle™: This area has wheelchair-accessible diggers, play tables, and sand pits where guests can build the sandcastle of their dreams or whatever they want. Bob pointed out a feature of these play areas which is sometimes overlooked. "Some guests don't seem to notice the ramps on our play-scapes are double-wide and can easily accommodate wheelchairs." This feature is definitely a thoughtful inclusion. There are so many other things to see and do at Morgan's Wonderland. From the Walk & Roll Path and Around The World to the Wharf for catch-and-release fishing and Starlight Amphitheater for wonderful shows, guests may need to make several visits to explore all this park has to offer. 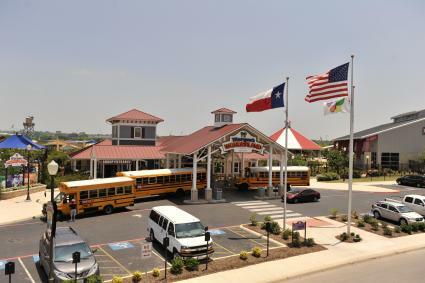 As a non-profit organization, admission for guests with special needs is free. Family members, caregivers, friends and the public are admitted for a nominal fee. There are two locations in the park where visitors will find snacks and non-alcoholic beverage offerings, and guests are welcomed to bring their own food and dine at Picnic Place in shaded comfort. Bob stresses the park was designed to be completely inclusive, and service animals are welcome when accompanying the individuals they assist. With tremendous reviews on Yelp and Google, it's no wonder this place is seen as transformational for everyone who visits the park. Given all the rides and attractions at Morgan's Wonderland, Bob answered confidently about his favorite aspect of the park. "It's the ongoing opportunity to see guests with physical and cognitive challenges thoroughly enjoy themselves in an environment without barriers." That seems to be the perfect answer for this most remarkable and thoughtful theme park.